To Cite: Mohseni-Bandpei A, Ashraﬁ S D, Kamani H, Paseban A. Contamination and Ecological Risk Assessment of Heavy Metals in Surface Soils of Esfarayen City, Iran, Health Scope. 2017 ; 6(2):e39703. doi: 10.5812/jhealthscope.39703. Background: The urban soil characteristic is very important since numerous people live in cities nowadays. In recent decades, heavy metals enter into the urban environment due to the urbanization and different activities in cities. These metal contaminations can pose serious threats on community health. Contamination factor is a suitable tool for ecological geochemistry assessment. Objectives: The current study aimed to determine the distribution and concentration of heavy metals (Ni, Pb, Zn, Cd, Cu and Cr) in soil from urban soils, assess the pollution level and potential ecological risk of heavy metals. 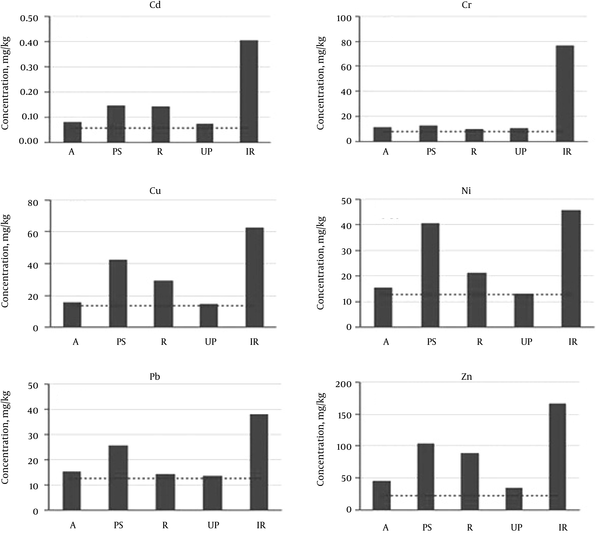 Methods: Forty surface soil samples from different areas with different functions in five districts of Esfarayen, Iran, were collected and transferred to laboratory, after drying the samples at laboratory temperature, they were analysed to measure Ni, Pb, Zn, Cd, Cu and Cr using inductively coupled plasma optical emission spectrometry. Results: The results showed the mean contents of Cd, Cu, Cr, Ni, Pb and Zn in soil of Esfarayen were 0.21, 33.27, 39.9, 32.3, 25.2 and 106 mg/kg, respectively, which were more than the natural background content. The potential ecological risk index ranged from 21.0 to 651 with a mean value of 159. Conclusions: Among different functional areas, the industrial areas had the maximum metal concentrations. According to the potential ecological risk indices, industrial region and city squares in Esfarayen have serious metal contamination and belong to the considerable pollution level. The results of the current study are very important for managers who define development strategies in cities and are also good to source pollution reduction. Contamination of urban surface soils with heavy metals is one of the worrying problems owing to their extensive causes, resistant to biodegradation, toxic and accumulative properties. Heavy metals and other pollutants in urban surface soils are usually originated from different sources of industrial activities, fossil fuel combustion, transportation and waste disposal (1, 2). The severe accumulation of rare metals in the urban surface soils have harmful effects on soil ecosystem, citizens’ health and cause other environmental problems. Various literatures documented on heavy metal contaminations in various surface soils around the world (2). Low level of some heavy metals such as cadmium and lead are dangerous to human health (3). Generally, heavy metals can cause different health problems in humans. For example, cadmium accumulation in human body causes malfunction of kidney, cancer and lead in body causes neurological disorders, anaemia and renal damage; and frequent presence of heavy metals in soil is reported as an indicator of the quality of the urban environment (4). Heavy metals do not decompose in the environment and finally, through breathing and food chain, accumulate in tissues. They can cause injuries in the nervous systems and internal organs (5). These metals can increase cardiovascular diseases, reproductive problems and different cancers (6, 7). In recent years, the presence of heavy metals in surface soil is one of the main concerns of environmentalists and the evaluation of topsoil contamination in the populated areas is one of the major concerns related to the public health. In this regard, contamination factor (Cf), potential ecological risk factor (Er) and potential ecological risk index (PER) are indices to evaluate the heavy metals contamination level. These indices simply show the level of contamination or enrichment in the soils, sediments and road dusts (8). Esfarayan is one of the industrial areas in northeast Iran that was quickly industrialized and urbanized in recent decades. There are a lot of industrial activities; Esfarayen industrial complex, Esfarayen Lule Gostar company and other small industries and residential heating; heavy metals from the aforementioned activities threaten the environment and human health in this city. To the best of the authors’ knowledge, there are not any studies regarding the heavy metals content in Esfarayen and their contamination level. Therefore, the current study aimed to determine the distribution and concentration of heavy metals (Ni, Pb, Zn, Cd, Cu and Cr) in soil from urban soils, assess the pollution level and potential ecological risk of heavy metals. This evaluation was performed in Esfarayen, North Khorasan province, Iran. It is located on longitude 56° 57’ - 58° 7’ and East and latitude 36° 40’ - 37° 17’ North. It has an area of 5019 km 2 with 156 thousand inhabitants. In this area, the average annual precipitation is 212 mm with a temperate mountain climate and an annual average temperature of 8 - 13°C. The wind direction is from the North-West to South-East with the annual average speed of 4 - 6 ms-1. Forty surface soil samples (0 - 2 cm) were collected from different major functional areas in five districts in September 2015. To collect composite samples, a few subsamples were randomly collected from each site and mixed to achieve one composite sample (9). Among 40 samples, numbers 4, 8, 5, 17 and 6 were from suburbs, industrial regions, urban parks, city squares and roadsides, agricultural regions and residential areas, respectively. The geographical coordinates of samples were recorded using a global positioning system (GPS). In order to determine the background heavy metal concentration in suburbs, sampling was carried out from one meter under ground level (10). The samples were collected from topsoil and then transferred to the laboratory in closed polyethylene bags. To prevent the loss of possible volatile metallic compounds, all samples were dried at lab temperature for 10 days and sieved to remove particles bigger than 2 mm. One gram of each dried sample was digested according to the United States environmental protection agency (USEPA), method 3050B, using HCl, HNO3 and H2O2 for the heavy metals analysis (11). The digested solution was cooled and filtered (pore size 0.45 µ). The concentrations of Ni, Pb, Zn, Cd, Cu and Cr were determined in the filtrated solution using inductively coupled plasma optical emission spectrometry (ICP-OES) (Spectro Arcos Model, Cleve, Germany). Table 1 presents the descriptive statistics of heavy metals contents of urban soils in the study. According to Table 1, there was significant differences among different heavy metal contents. The concentrations of six heavy metals (Cd, Cr, Cu, Ni, Pb and Zn) varied between 0.01 - 1, 3.82 - 150, 6.14 - 126, 7.05 - 87.9, 8.58 - 67.9 and 23.2 - 338 mg/kg, respectively. The mean concentrations were 0.21, 33.27, 39.9, 32.3, 25.2 and 106 mg/kg, respectively. The average concentrations of the investigated metals in all sampling sites with all land uses were in the order of Zn > Cu > Cr > Ni > Pb > Cd. The average concentrations of the investigated heavy metals, except Cu, were lower than those of the soil standard of the Netherlands (target value), and the average concentrations of them were lower than the recommended guideline values (12). The mean concentrations of all metals were below the Canadian soil quality guidelines (13). Low heavy metal concentrations in some samples compared to the other standards indicated that these sites were not affected seriously and the effect of pollutant sources can be ignored while high heavy metal concentrations indicated that the pollutants seriously influenced the soil environment (12, 13). For some sampling sites, the concentrations of Zn were higher than those of the soil standard of the Netherlands (12), where 2.78% of samples were higher than those of the Dutch soil quality intervention value. It was found that 2.78%, 8.33%, 38.89%, 27.78% and 19.44% of the Cd, Cr, Cu, Ni and Zn concentrations, respectively, were higher than those of the Dutch soil quality standard (target value) (12). 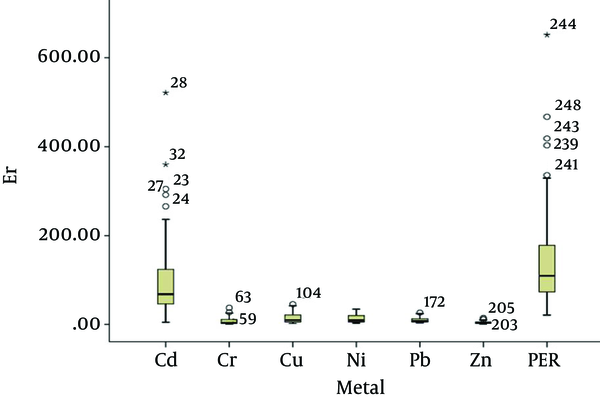 The concentrations of Ni, Pb, Cd, Zn and Cr in various areas with different uses were higher than those of the corresponding natural background of heavy metals in the soil of Esfarayen (Figure 1). Heavy metal contents in the industrial areas were pretty higher than those of other functional areas in Esfarayen. In the current study, significant differences (P < 0.05) were observed between different land uses. The main sources of emission of heavy metal in the investigated area were industrial activities including Esfarayen industrial complex and Luleh Gostar industrial Company. According to the previous study in Shenyang, Pb concentration varied in different functional areas with the order of industrial area > commercial area > residential area > suburb (14), which was consistent with that of the present study. City squares and roadsides contained rather higher concentrations of heavy metals than residential areas. Main roadsides are usually under the influence of high traffic which causes emission of heavy metals into the environment. Lu and Bai (15) stated that automobile exhausts are the main source of Pb and emission of other heavy metals into the roadside soils near the motorways. These sources of emission also increase human exposure to high levels of heavy metals (16). A, Agriculture; PS, public city square; R, residential area; UP, urban park; IR, industrial region. Horizontal lines represent the natural background. Numerous studies have proved that the elevated concentration of Cu and Zn can be released to the urban environment from various parts of automobiles, especially break abrasion (17, 18). According to the above results, industrial and traffic activities were the main sources of emission of heavy metal into the environment of Esfarayen. Heavy metal concentrations in the urban park areas were relatively lower than those of other functional areas in Esfarayen. The mean concentrations (mg kg-1) of heavy metals in urban soils of different cities worldwide are given in Table 2. On the whole, the heavy metal concentrations in the present study were moderate compared to the reported results from other studies. The results of the study in China were similar to those of Beijing and Tianjin and they were also comparable to the results of less industrially developed cities such as Chongqing and Shenzhen. The results of the study were much lower than the reported results of large and industrialized cities such as Changsha, Tehran, Baoji, Istanbul, Nanjing and Xi’an. The average concentrations of Cd, Cu, Pb and Zn were fairly low compared to the reported concentrations in cities with large or old industrial activities such as Mexico City, Naples, Palermo, Seville and Turin. The average concentrations of Cr and Ni in soils of Esfarayen were comparable to those of the other studies, except for Turin and Mexico City. Concentration of Pb in the current study was lower than those of the other studies. Small amounts of Pb may display an advance of urban soil characteristics since the consumption of leaded gas was forbidden in Iran. Contamination factors were computed according to the local background values of heavy metals in soils of Esfarayen using the following equation (Equation 1) (19). where Cheavy metal is the measured concentration of a heavy metal in a sample and Cbackground is the mean concentration of the corresponding heavy metal in the local background samples. Hakanson (20) defined four classes of Cf, five classes of Er, and four classes of PER, as presented in Table 3. The Cf, varied considerably in various metals and various typical soils. The Cf value varied from 0.17 to 17.4 with a mean value of 3.63 for Cd, 0.48 to 18.8 with a mean value of 4.18 for Cr, 0.45 to 9.16 with a mean value of 2.90 for Cu, 0.56 to 6.94 with a mean value of 2.55 for Ni, 0.61 to 5.35 with a mean value of 1.96 for Pb and 1.00 to 14.6 with a mean value of 4.55 for Zn. The results showed that Cf mean for Cd, Cr and Zn were within the considerable contaminated grade (3 ≤ Cf < 6) and mean of Cf for Cu, Ni and Pb were in moderate contaminated grade (1 ≤ Cf < 3). For Cd, Cr and Zn mean concentration in soil samples of industrial region sites showed high contamination, and for Cd, Cu and Pb concentration in soil, urban park sites showed low contamination. Potential ecological risk index (PER) and ecological risk factor (Er) are useful techniques for environmental assessment, suggested by Hakanson (20). Responsibility and sensitivity of the biological community to the toxic substances can be illustrated by PER and Er. PER also illustrates the potential ecological risk caused by the overall contamination. Er of each heavy metal and PER for heavy metals are calculated by the fallowing equations respectively (Equations 2 and 3). In the above formula, Tr is the toxic factor for each of the toxic metals (20). The amounts of Tr were confirmed 30, 5, 5, 5, 2 and 1 for Cd, Cu, Pb, Ni, Cr and Zn, respectively (20). The computed results of Er and PER for the investigated toxic metals in topsoil of Esfarayen are presented in Figure 2. The order of mean Er values were Cd > Cu > Ni > Pb > Cr > Zn with mean Er values 109, 14.5, 12.7, 9.78, 8.35 and 4.55, respectively. The amount of Eri for Cd was 109, which is considerably greater than that of other investigated metals. Results implied a significant ecological risk for Cd and a little potential ecological risk for Cu, Ni, Pb, Cr and Zn. This result was consistent with those of other studies (21). There was a difference between Er of Cd and those of other metals, which resulted from highly toxic factors of the abnormally high concentrations at most sites (21).The ecological risk factor of Cd was high (Er > 80) for many evaluated sampling sites (38.9%). The results showed that Cd had high adverse effects on human community and live ecosystem. According to reported studies (1), Cd principally reveals the potential ecological risk of the environment. With comparison of land uses, the potential ecological risk factors were different (P < 0.05) for various land uses (Figure 2). The PER ranged from 20.88 to 651.28 with a mean value of 158.85, which indicated significant ecological risk for the investigated heavy metals in this area. According to the previous classifications, 16.67% of the samples were classified with a high potential ecological risk, 22.22% were classified with a considerable potential ecological risk, 36.11% were considered to represent a moderate potential ecological risk, and 25% were classified as causing low potential ecological risk. The investigation of 40 soil samples from different functional areas in five districts of Esfarayen revealed a clear accumulation of Cr and Zn. Among the functional areas the industrial regions and the city squares had the most serious metal contamination. Based on the results of the Cf, Er and PER, the investigated soils were moderately contaminated and had a considerable ecological risk on human community and live ecosystems in some sampling locations. The authors would like to thank the North Khorasan University of Medical Sciences for the ﬁnancial support of this study (No.93/p/764). Authors also wish to thank technical staff in the laboratory, Mr. Nazmara, for his cooperation. Authors’ Contribution: Anoushiravan Mohseni-Bandpei, Hossein Kamani, study design; Seyed Davoud Ashraﬁ and Ali Paseban, performing the experiments; Hossein Kamani and Ali Paseban, data analysis; Hossein Kamani and Ali Paseban, contributing reagents/materials/data analysis; Hossein Kamani and Ali Paseban, writing the manuscript.